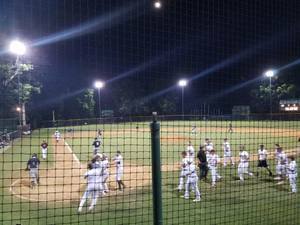 PURCELLVILLE, VIRGINIA-- Jarrett Clymer raced home on a wild pitch in the bottom of the 10th inning to give the Purcellville Cannons a 3-2 walk off victory over the New Market Rebels on Sunday night at Fireman's Field. With the win (the team's 11th at home this season), the Cannons move to just one game back of the Rebels for the fourth and final playoff spot in the VBL North division with seven contest remaining on the regular-season slate. Facing a Rebels' lineup that averaged 10 runs per game against the Cannons in four matchups this season, LHP Pat Doudican authored a quality start to keep the Cannons in the game despite allowing a pair of early runs. A Luke Manzo tripled gave New Market a 1-0 lead in the third inning and Luke Bolka followed one inning later with an RBI single to give the Rebels' a 2-run cushion. Following the runs, however, Doudican settled in, retiring 11 of the final 14 batters he faced in a 7-inning, 2-run performance. The College of Charleston product struck out eight batters in his second straight no-decision, bringing his team-leading total to 32 this season. Rebels' starter Joey Johnson (Dyersburg State Community College) had been one of New Market's most reliable hurlers this season, and proved why on Sunday. After giving up a lead off single in the first inning to Denathan Dukes, Johnson retired 14 in a row before PJ Harris lined a single to center field to lead off the sixth. Harris would come around to score later in the inning on a ground out by Dukes to make it a 2-1 game. Johnson had not pitched more than six innings in an outing this season and almost immediatley ran into trouble when he came back to the mound following the seventh inning stretch. After getting Tyler Ratliff to line out to begin the frame, Ray Hernandez singled and was followed by Colton Lightner's double that put two runners in scoring position with only one out. With the bases loaded and two away in the inning, pinch-hitter DeAndre Amion lined a base hit to center field off Rebels' reliever Brandon Miller to score Hernandez and tie the game at two. Following Doudican's exit, Cannons' closer Will Reed (Harford Community College) swiftly took care of New Market's mighty bats, tossing three scoreless innings while allowing just one hit and striking out four. Reed lowered his season ERA to 1.13 and picked up his team-leading fourth victory of the season. Against New Market reliever Mat Oset in the bottom of the 10th, Harris walked to lead off the inning and was replaced by Clymer on the bases, who would advance to second on a sacrifice bunt by catcher Matt Reed. After an Andrew Zban walk, the fourth pitch of Dukes' at bat trickled off the glove of catcher Daniel Kerwin and allowed Clymer to score the winning run in the Cannons' first extra-inning victory of the summer. With the win, Purcellville (14-21) moves to just a game back of the Rebels (15-20) in the postseason chase and will be watching closely as New Market hosts the defending VBL-champion Strasburg Express (24-9) on Monday night. A Rebels' loss would decrease the Cannons' deficit to just a half game. After an off day on Monday, the Cannons will be back in action when they travel to Jim Barnett Park to take on the Winchester Royals (20-15). Purcellville is 1-2 against the Royals this season, 0-2 on the road. Southpaw Joey Jones (University of South Alabama) is 3-0 with a 3.56 ERA in eight games this season and will take on the Cannons for the first time on Tuesday. 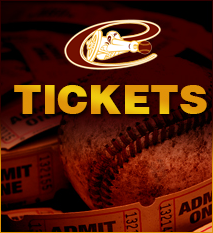 In his last start on July 13th, Jones earned his third victory of the summer by authoring a 5-inning shutout of the Woodstock River Bandits in a 9-0 Winchester victory. RHP Matt Copley (Fairmont State University) gets the nod for the Cannons, looking to build off his impressive performance last time out, seven innings of one-run ball in the team's 3-2 win at Harrisonburg on July 13th. Copley is 1-1 with a 3.28 ERA this season and allowed four earned runs in five innings of work and got the no-decision in his one previous engagement with Winchester, a 12-4 Cannons' loss on June 24th.